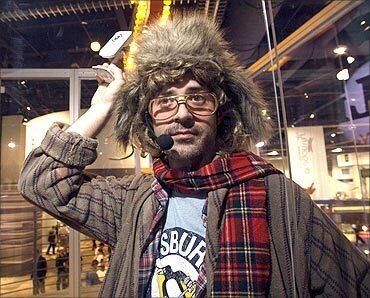 The annual Consumer Electronics Show in Las Vegas showcased smartphones, tablets, 3D- and Internet-enabled TVs that are expected to make the biggest splash in 2011. The battle for recession-weary consumers will pit Samsung Electronics, Sony Corp, LG Electronics, Google Inc, Netflix and Apple Inc against each other, all fighting to make their technology the standard. 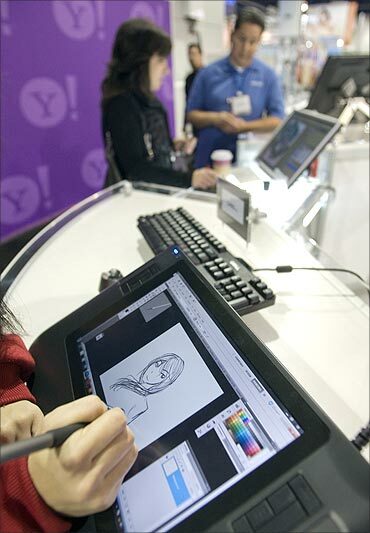 Image: A visitor tries out a Wacom Bamboo Pen and Touch tablet during the 2011 International Consumer Electronics Show (CES) in Las Vegas. 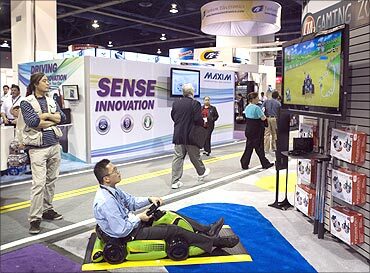 A man tries out a CTA Inflatable Kart for the Nintendo Wii as he plays a racing game during the 2011 International Consumer Electronics Show (CES) in Las Vegas. 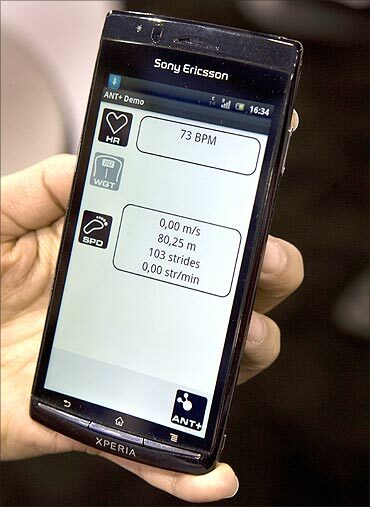 A Sony Ericsson Xperia Arc smartphone is shown with an ANT+ fitness application. Image: Sony Ericsson Xperia Arc smartphone. 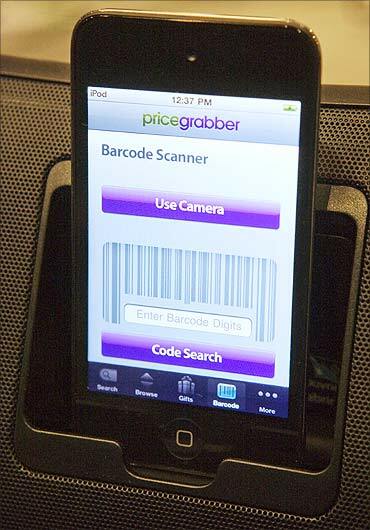 The updated PriceGrabber mobile applications now allow shoppers to set price alerts for local retailers so they are alerted when stores drop the price of their items to a certain level. Image: An iPod with a PriceGrabber mobile application is set on display. 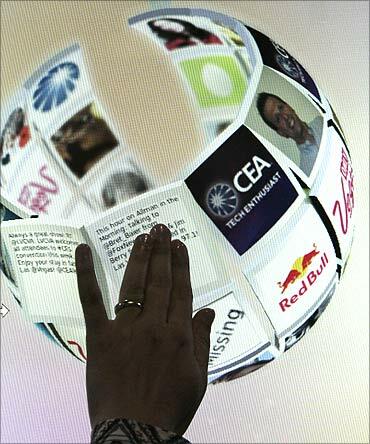 A woman checks a touch screen display on the second day of the Consumer Electronics Show (CES) in Las Vegas. 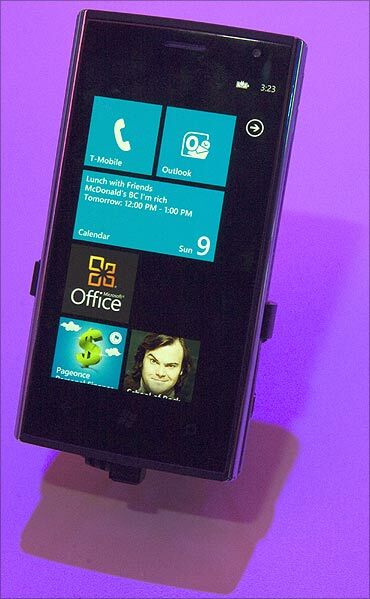 A Dell Venue Pro smartphone using the Windows 7 operating system is shown at the Microsoft booth. Image: Dell Venue Pro smartphone. GM announced at the CES that the $299.00 rear-view mirror with traditional OnStar features, such as call-centre support and post-collision alert, will become available as an aftermarket product. 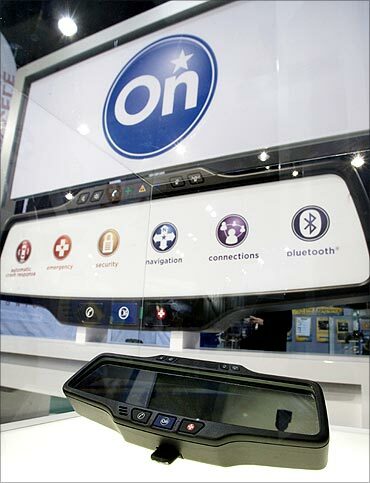 Image: A General Motors OnStar rear-view mirror is displayed. Super slim and light, Xperia arc is just 8.7 mm at its thinnest part and has a extra wide 4.2 inch multi-touch screen. The X8 has a 3-inch capacitive LCD screen with resolution of 320 x 480 pixels. 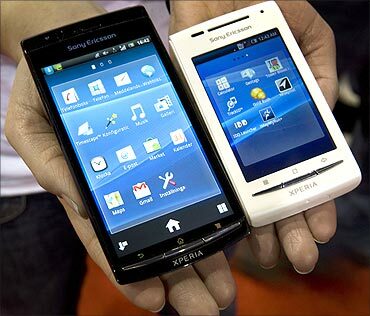 Image: Sony Ericsson smartphones, Xperia Arc (L) and XperiaX8. 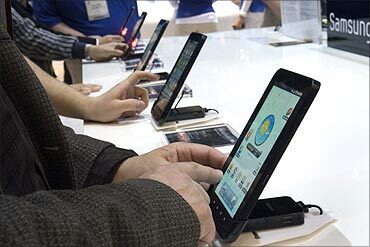 People try out the Samsung GalaxyTab during the 2011 International Consumer Electronics Show (CES) in Las Vegas. 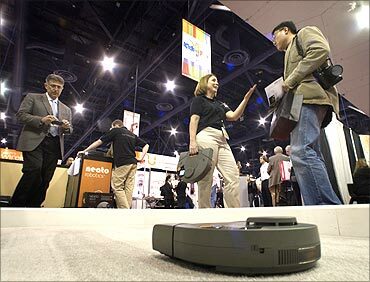 A Neato XV-11 robotic vacuum system cleans a carpet during the 2011 International Consumer Electronics Show (CES) in Las Vegas. The robot is equipped with laser vision mapping system so that it can cover the entire area of each room and it returns to a charging base when low on battery power. Image: Neato XV-11 robotic vacuum system. Intel demonstrator Eric Stevens (R) creates digital art at Intel's 'Visibly Smart Experience', a graphics demonstration showing off the processing power of Intel's 2nd generation Core processors, during the 2011 International Consumer Electronics Show (CES) in Las Vegas. 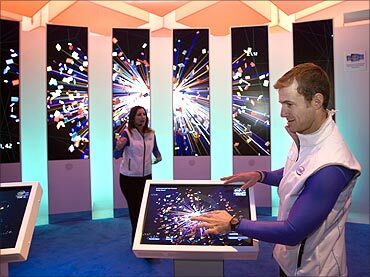 Image: Intel's Visibly Smart Experience. 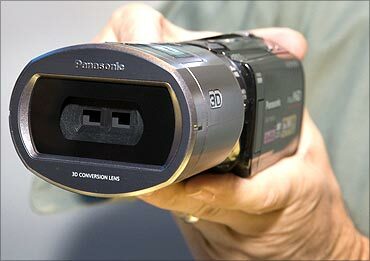 A Panasonic HDC-TM900 camcorder with VW-CLT1 3D converter lens is displayed during the 2011 International Consumer Electronics Show (CES) in Las Vegas. 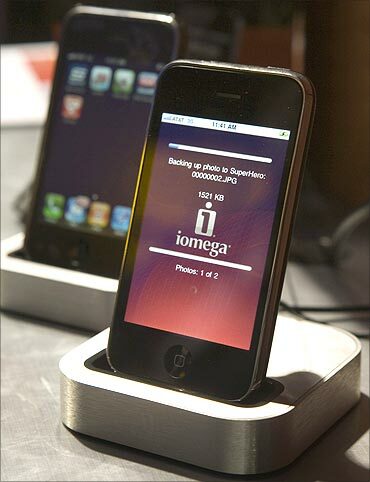 An Iomega Superhero backs up information from an Apple iPhone during the 2011 International Consumer Electronics Show (CES) in Las Vegas. 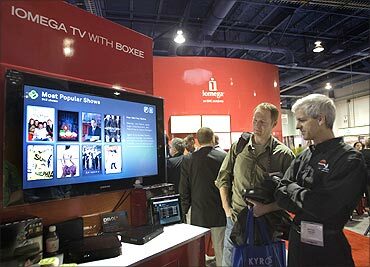 Iomega TV with Boxee devices are displayed during the 2011 International Consumer Electronics Show (CES) in Las Vegas. Image: Iomega TV with Boxee devices. Michael Cassano poses with a D-Link wireless-N network camera while staying in a 'glassed-in' home office at the D-Link booth. The home office was part of D-Link's campaign titled 'Make Home Your Hottest Spot'. Yahoo! announced a new "broadcast interactivity" feature for the Yahoo! Connected TV platform and D-Link announced a Yahoo Connected TV media player that will support Yahoo's new interactive services on older televisions that are not Internet enabled. 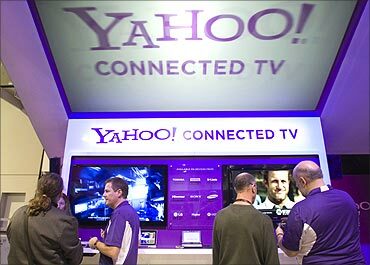 Image: The Yahoo Connected TV booth is shown during the 2011 International Consumer Electronics Show (CES). Audi e-tron Spyder and the hottest gizmos! Images: India's hottest selling passenger cars!